Honestly, seven years ago I would have rolled my eyes reading such “garbage” while sipping on a well-chilled Chardonnay. But then life has a way of running its own course. The more I fought my own path, the more reminders were rocketed my way, letting me know, in no uncertain terms, that I, indeed, was not the ruler of the universe and, in fact, have much less control of my destiny than I could imagine! I grew up a child of privilege. By age 16, I had moved countries six times, could speak three languages fluently, and had been exposed to more cultural diversity than many experience in a lifetime. While I was worldly in some ways, I was clueless in others. I lived in a cocoon of fine homes, fancy cars, and private schools. During a bout of pneumonia, I remember asking the nurse at the hospital why there wasn’t any Dijon mustard to go with my meal. I was always taught that I could be better…if I tried harder. That translated for me, from a very early age, into the notion that I wasn’t good enough, that at some point in the future, when I was my BEST, I would be good enough. I can imagine that some readers might relate. Don’t get me wrong. Hard work and dedication are, in my humble opinion, absolutely necessary for fulfillment in one’s life. It was, I believe, my child brain that didn’t process the instruction as it was intended. And so, my childhood, teen years, and early adult life were infused with drive and a “do better” mantra. But for me, my drive to improve was only sustainable for brief periods of time. I would inevitably crash and burn into a variety of different abysses, only to pick myself up and try again and AGAIN. This time will be different. After marrying in my late 20s, birthing two beautiful babies, and moving two more times, I hit bottom. It was as if I was floating outside of my body, watching my life, but not really participating in it. On the outside, I appeared to have the “perfect” life: wonderful husband, beautiful children, three dogs, lovely home, two cars. All that was missing was the picket fence. But my perma-grin and my maniacal volunteerism made up for the lack of a fence. At home in the night, alone with my thoughts, I could not sit in my skin anymore. By day, I silently searched for ways to improve. I must be doing something wrong. There were self help books and healthy diets. There was constant busy-ness. And then, eventually, there was nothing. No more smile, no more energy, no real relationships—just me, living outside my body. In the midst of all this, life handed me examples and opportunities to let go of my vice grip; she also pushed open the door, just a hair, that I might walk in a different direction. And on one fateful day, for some reason I decided to peer around that door. There I met someone: a fiery, red-headed dynamo—my first yoga teacher. Imagine what your stereotypical yoga teacher might look like and then smash that image. As I spent my first few lessons curled up in the fetal position, I was present to just being “seen, heard, and understood” by the generosity of another human being. There was no judgment. And, for those moments, I was enough. I have heard stories of sudden “Great Awakenings.” My story is nothing of the kind! As weekly lessons evolved into daily practice, yoga became my new “be better” project and, after countless hours, I was sure I had mastered the physical form. Now I was whole—now I was perfect! What had begun as healing had now become an unhealthy addiction. Yes, even yoga can be addictive when used as way out. Although I was certainly not living in that abyss anymore, I had not begun truly to live in my body and be in the acceptance of ME, flaws and all. Following three years of “perfect” practice and after completing an intensive teacher training, I was struck with a violent attack of vertigo which, ultimately, lasted eight months—eight straight months of dizziness, nausea and, yes, definitely depression. My “drug” had been taken away. Yet again, I filled my life with busy-ness and bravado. Finally, when the dis-ease of doing became too uncomfortable, I returned to my practice. There was fear of a repeat episode, no flexibility, no strength and, yes, a touch of humility. I was a beginner. Hallelujah! There’s something so beautiful about the excitement and fragility of new beginnings; the possibility to see with new eyes; to see the perfection of imperfection. Slowly, life itself began to take a little less effort. And, so, now before I practice and before I teach any class, I remember. I remember that I am not the ruler of my students, let alone the universe. I remember that I am so incredibly fortunate to have been gifted a body that works in all its imperfection. Everyone has their own story that they bring to their mat and we are all completely whole just as we are. Each day we have the choice to begin again. Dominique Veniez is a certified YogaWorks trained yoga teacher in Vancouver, BC with training in restorative yoga and yoga for PTSD, Addiction, and Mental Health. 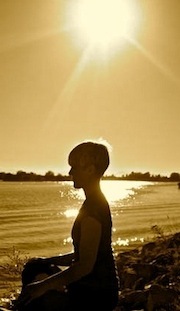 Through her own yoga journey, Dominique can attest to the healing qualities of yoga. Teaching in studio, school, hospital, and private settings, her belief is that the lessons learned on the yoga mat can show us how to stay steady in the chaos of life and keep a sense of humor along the way. Photo credit: courtesy of Dominique Veniez. Thank you for sharing this. All of it. Yoga is miraculous.